Dibond® is the industry's leading aluminum composite material (ACM) for more than 15 years. 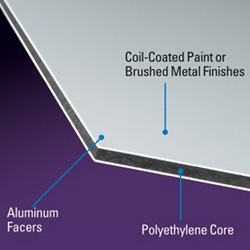 It is comprised of two pre-painted sheets of .012" aluminum with a solid polyethylene core. Made In USA.